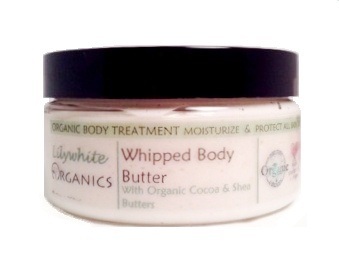 Rich, creamy and soft this nourishing whipped body butter is packed full of organic cocoa and shea butters that absorb quickly to deeply moisturize and treat dry skin. The organic aloe vera helps to heal, nourish and soften like no other. 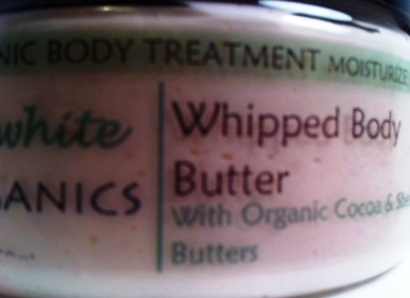 Has a delicious light chocolate scent from the organic unrefined cocoa butter. Organic Virgin Shea Butter - Virgin Shea butter is unrefined and thus retains the natural nourishing components, vitamins and minerals and allows the nutty, smoky scent to be naturally preserved. Although refined shea butter is cheaper, we do not use it because the refining process (which includes bleaching) strips the Shea of its many natural healing qualities. Organic Unrefined Cocoa Butter -just like unrefined shea butter, the cocoa butter we use is organic and unrefined and thus retains all the natural vitamins and essential fatty acids and has not been exposed to harsh bleach or chemicals.